Emirates National Oil Company (ENOC), a wholly-owned entity of the Dubai Government, is a leading force in the economic diversification and sustainable development of the UAE. Established in 1993, ENOC’s primary focus has been to develop downstream and upstream activities in the oil and gas sector. 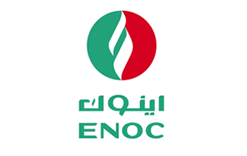 Over the years, ENOC has expanded into several high-growth business sectors to create long-term value for its stakeholders.